Archives : 4448 - A CRITICAL SUPPORT - 05/06/2009. 4448 – A CRITICAL SUPPORT - 05/06/2009. Sensex has formed a small white candle on the weekly charts, whereas on the daily charts it has formed a ‘Shooting Star’ formation which is indicating of a Bearish reversal pattern. The Sensex has taken strong support around 14600 levels twice on Tuesday and Thursday and hence this level assumes great significance. If this level is broken then the Sensex can slide all the way down to 13611-13479. The Sensex has formed 13 consecutive white candles on the weekly charts and is now slowly losing the momentum. It has been an unprecedented rise as even in the Bull Run the Sensex never formed 13 consecutive white candles on the weekly charts. As the Sensex is slowly losing momentum chances of black candle appearing this week increases. The momentum indicators are pointing downwards, though not giving sell signal, and are showing signs of tiring out. The upmove will be seen only seen if the Sensex manages to stay above 15257. Then the pattern wise targets for the Sensex are 15493 and 16342. The Sensex is retracing the entire fall from 21206-7697 and is now well above the 50% mark (14452) and is now heading towards 16045, which happens to be the 61.8% retracement. On the downside in a correction the Sensex will take immediate support at 100 Week M.A. which is at 14266 and below which the 200 Week M.A. 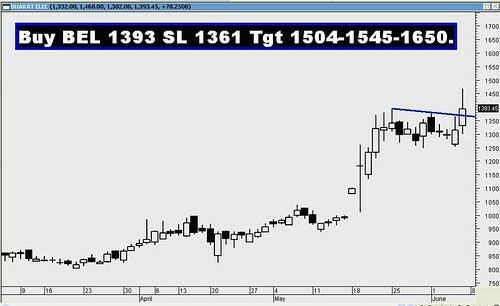 (12881) will give very strong support. The Trendline support for the Sensex is at 13182. For the week ahead the Resistance is at 15332-15579-16045. Support is at 14677-14266-14002. Nifty opened the week at 4450, made a high of 4636, low of 4450, and closed at 4587. Thus the weekly gain was 138 points. Nifty has formed a small white candle on the weekly charts, whereas on the daily charts it has formed a ‘Shooting Star’ formation which is indicating of a Bearish reversal pattern. The Nifty has taken strong support around 4448 levels twice on Tuesday and Thursday and hence this level assumes great significance. If this level is broken then the Nifty can slide all the way down to 4155-4092. The Nifty has formed 13 consecutive white candles on the weekly charts and is now slowly losing the momentum. It has been an unprecedented rise as even in the Bull Run the Nifty never formed 13 consecutive white candles on the weekly charts. As the Nifty is slowly losing momentum chances of black candle appearing this week increases. The upmove will be seen only seen if the Nifty manages to stay above 4649. Then the pattern wise targets for the Nifty are 4719 and 4926. The Nifty is retracing the entire fall from 6357-2252 and is now well above the 50% mark (4305) and is now heading towards 4789, which happens to be the 61.8% retracement. Open Interest build up is seen at 4500 and 4200 PUT which means in case of a downfall 4500 and 4200 will act as strong support. Strong CALL writing is seen at 4700 strike price which will act as resistance going forward. Nifty O.I. PCR is at 1.25, Which is indicative of good hedge position in the market. The Trendline support for the Nifty is at 3965. For the week ahead, the Resistance is at 4649-4719-4803. Support is at 4448-4305-4155. 1. Buy BEL 1393 SL 1361 TGT 1504 – 1545 – 1650. 2. 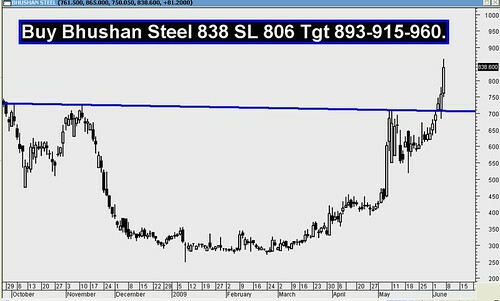 Buy Bhusan Steel 838 SL 806 TGT 893 – 915 – 960.